I am linking up with Aileen Miracle from Mrs. Miracle's Music Room today to share my five favorite pins of October. When I remember I have been sharing a "Pin of the Day" on my Facebook Page, so you can check in over there to find even more great pins. I think I pinned this last year and forgot about it. It's probably too late for me to order to use this year, but I will definitely be tying this in next year. 3) Musical Dice - How fun would these be for rhythm composition? 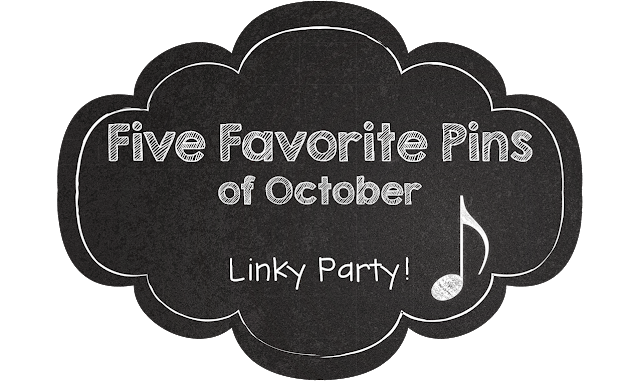 I hope you have enjoyed these five pins of October! If you loved these pins as much as I did, pin them to your own pinterest boards to save them for later. Great pins, Lindsay! Thank you so much for linking up!